April has been a month packed with press events, social media photoshoots and trade shows, and the team have reaped a bumper 121 pieces of online and print coverage. Having had nonstop meetings with journalists for coffees and brunches, while attending media events and conferences we’ve continued to hero our clients and network within the industry to maintain our high level of quality coverage. This month our team organised a Paul Edmonds London press morning in Battersea whereby journalists from publications such as The Times, Woman & Home, S Magazine, LOOK and HELLO! visited Paul’s second salon at the iconic Battersea Power Station, Circus West Village Development. Here they experienced bespoke Shu Uemura hair treatments and breakfast blow-dries done by Paul and his expert team. The much anticipated SCRUBD for men Anti-Ageing Eye Gel campaign began with a photoshoot and vox pop, taking place on 24th April in the heart of Soho, with the disarmingly cool Peter Gemmell AKA ‘The Gentleman Select’ at the helm. Brilliant photographer Nunzio Prenna was on side to capture the natural essence of SCRUBD in the studio. 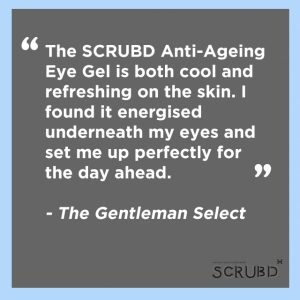 This campaign will promote the quintessentially British grooming brand, SCRUBD, on social media and demonstrate how men should master their Eye Gel application and overall skincare routine. The UK’s leading medical aesthetics conference and exhibition, ACE, also took place on the 27th April, at which several our clients exhibited including Teoxane Cosmeceuticals, Circadia by Dr Pugliese, ZO Skin Health from distributor Wigmore Medical, Lumenis, Hydropeptide and Jan Marini. This exhibition is a great chance to allow consumers and professionals alike to explore their latest offerings, watch live treatment demonstrations and network with manufacturers, clinicians and distributors over the course of two days. AlumierMD, a cosmeceutical brand which has been stirring up the market since its launch in 2016, gained coverage in Tatler and Aesthetics Medicine, Get the Gloss, 1883, Eat Wear Travel’s blog, In the Frow and Nathalie Eleni’s social media. AlumierMD’s Clean and Clear Solution came highly commended in Tatler’s 2018 Beauty Awards as a prized illuminator.